A Year of Being Here: Barbara Crooker: "March"
flying off with bright fanfares, returning home in silence. his small chest still moving, up, and down. "March" by Barbara Crooker. Published by Barnwood International Poetry Magazine, 2007. © Barbara Crooker. 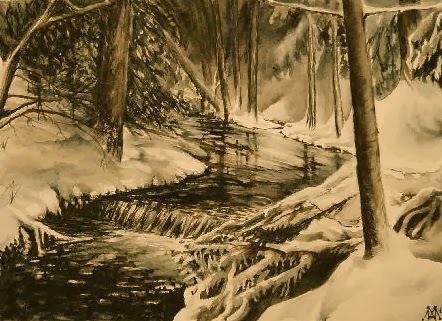 Image credit: "Jordan Creek Winter," painting in unknown medium by Mary Ann Huisman, 2007 (originally color).